Flexible positioning feature allows oval, circular and rectangular configurations. Number of machine feeds can be increased or reduced by simply adding or removing “T” sections. 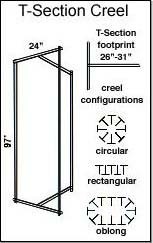 Pre-assembled sections allow for easy installation. Collapsible design allows for ease of shipment. Flexible tubing is available in standard or crimped styles. Crimped tubing is offered exclusively by Alandale and significantly reduces tension on yarn. Eliminates the need for air guns and hoses when threading yarn through tubes. Corresponding numbers on creel and machine make threading easier. Large vinyl-coated numbers from 1 to 120 are durable and easy to read. Cleans hard-to-reach surfaces easily with its long, rigid nozzle design. Conforms to all United States OSHA safety standards. Performance and safety tests based on 90 pounds maximum inlet pressure. Unique nozzle design provides an extra boost in cleaning power and is available in short or long styles.